Time moves quickly! With January behind us we’ve begun to wade into 2017 and already we’ve collected three moments of pride--pride at the maturity and growth in our youth. Robot Spartans preparing their Lego robot! We are always proud of our students, but recently several of them really outdid themselves. Robotics is one part of our middle school program where students learn how to work as a team to design, program and troubleshoot Lego robots. 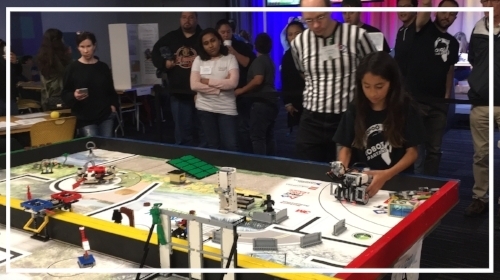 After competing this last fall in the First Lego League at Google’s Mountain View headquarters, one of our teams--The Robot Spartans—won both their Regionals and the “Judge’s Award” (for team conduct). The Robot Spartans will be competing this upcoming Saturday, February 4th at Sobrato High in Morgan Hill against 30 other Bay Area teams. You can read about their efforts in this Mercury News article [>here<]. Meanwhile our high school students in the LiT program havebeen engaging in their own kind of competition—specifically cooking. In the spirit of TV reality cooking shows, the two LiT cohort groups competed in preparibg candied sweet potatoes and salad versus mac ‘n cheese and pecan bars. In the chaos of chopping, stirring and talking the respective team leaders were able to exercise their skills in delegating and control while reflecting on their leadership style and strengths. The results were mouthwatering with the male cohort group claiming victory. Stay tuned for future competitive cooking stories! Finally, we would like to draw your attention to a letter written by one of our students who receives Bible lessons and tutoring from our volunteers. We don’t always get to see the impact that results from a real connection, but every now and then we do and it warms our hearts beyond words. Please pray for our students, their families and our various programs! We love our work but there is much, much more to be done! © Copyright 2018 Bayshore Christian Ministries. All rights reserved.